Mobile laboratory for Energy audit, procured with a support of the joint EU/UNDP Project “Community Based Approach to Local Development” (CBA) was officially presented in Lvivska oblast. This equipment will help to save money on energy audit for the social infrastructure objects and to implement energy strategy of Lvivska oblast. Energy audit is one of the necessary measures, which helps to define the ways of raising energy efficiency of social infrastructure objects. This kind of energy inspection helps to save up to 10% - 30% expenditures for energy resources. To use the equipment correctly energy audit experts provided practical training for those, who has already attended theoretical course at National University “Lvivska Politechnika” this year. 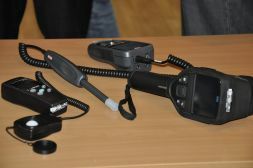 Experts presented this equipment for mobile laboratory to the media representatives of three oblasts – Lvivska, Ivano-Frankivska, Zakarpatska – during the First Media Day of CBA Project in sustainable development and energy efficiency which took place in Lviv. In 2012, Lvivska oblast together with other five oblasts of Ukraine (Dnipropetrovska, Zakarpatska, Zaporizka, Ivano-Frankivska, Kharkivska) was selected for special piloting of energy efficient component. In terms of special piloting in the oblast, mobile laboratory was procured. The car equipped with all necessary technic will provide energy audit and will develop energy passports for the objects of social infrastructure. The total cost of the equipment is more than UAH 500 ths.